Thursday February 3rd 1881 We girls took an early start to the valley doing our own driving. It was a pretty cold trip but we had a splendid visit at Aunt Emmas. It was only a little after five oclock when we got home. Otto went out to Franks this afternoon. And Rod Onie and Elmer went out to Welches to a party tonight. Friday February 4th 1881 I helped do up the work this morning and baked a couple of cakes. Mother went to town and Bridget and I got the dinner. Mrs Fletcher and Winnie were here in the afternoon I am knitting all my spare time. We heard that Uncle Jacob came last night. 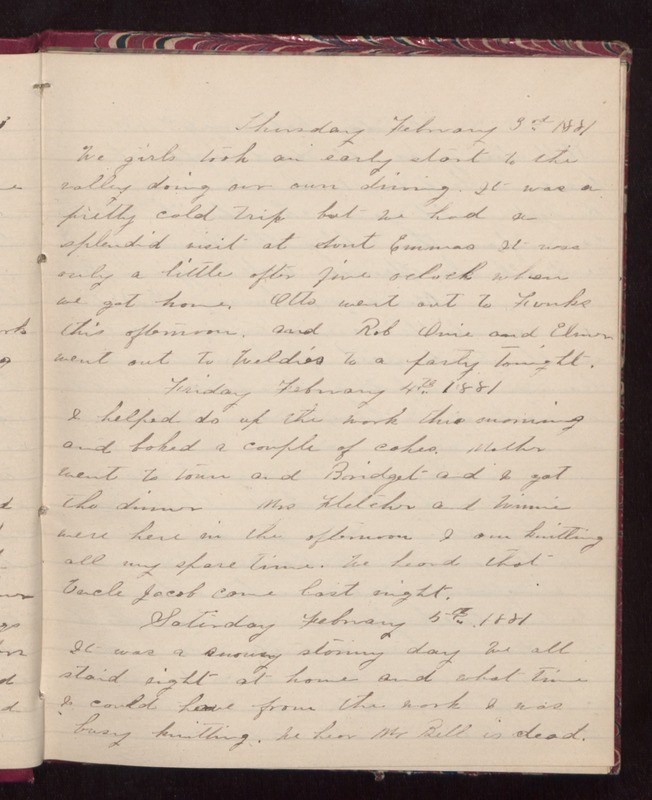 Saturday February 5th 1881 It was a snowy stormy day. We all staid right at home and what time I could have from the work I was busy knitting. We hear Mr Bell is dead.